When I announced that I will be doing a series on online marketing for small businesses and personal brands for the #MyFriendAlexa month, Akshata asked a question about “How to get more blog traffic after the post is published.” So I decided to do a post on that. 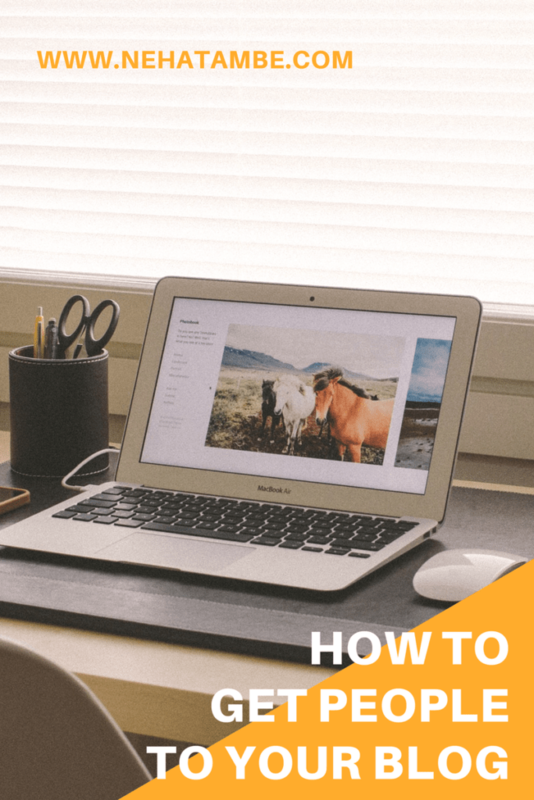 I also came across a handy guide from SocialMaharaj about ‘How to Start Blogging’ this post has some really good points and I recommend you check it out. Coming back to what I can offer, here are a few tips that can help you get more traffic on your blog. This is the first rule of blogging. Don’t falter here. Maintain a schedule. It could be 1 post a week, but do that. Maintain that schedule and post regularly on relevant topics. Maintain a good length for the post to be discoverable. Ideally, anything above 300 words is considered good content, but depending on your niche the length can vary. Authority blogs in various domains have posted as long as 2000+ words. Remember blogging is about 50% good + relevant content and 50% marketing. You might have a fantastic piece but as long as you don’t get people to your site, it is not going to get recognized. Be part of communities and be actively involved. Read, Comment, Share and discuss. Communities like BlogChatter, IndiBlogger have various contests or reading lists that you can make use of. Remember the person, adding his post on the list is looking for an audience, so he is bound to reciprocate by reading yours. Fix a schedule of when you plan to share your posts on such sites. Don’t do it all on the same day. Spread it over the week. If you are a new blogger, you can also participate in a FB support group that is created by Me and Zainab This group is a mix of support + knowledge sharing and exchange. – Budding Bloggers. Blogging campaigns like #MyFriendAlexa, #A-Z etc. help you blog better, blog consistently and discover new readers and blogs. Participate in such campaigns and connect with like-minded bloggers. Build your Tribe, who will offer support in terms of reading and sharing. Blogging is equivalent to nurturing relations, anyone who told you otherwise is taking you for a ride. Treat the community with the respect it deserves; take them as seriously as you would take an office colleague. A blogger visiting your site, should have the option to share and comment with ease. Make it easy for him. Offer plugin’s that provide shareability at one click. Some love Comment Luv, some hate it, but it is a good way to coax your reader to comment on your page. Ensure that it is formatted well and block spam with pro version or Akismet. No point attracting spam or senseless comments. Blog Traffic will not grow in a day. It needs consistent effort and patience. A good way is to maintain a log of your daily reads. Keep a target of 5-8 posts a day and read-comment and share them daily. Put more effort with bloggers who you consider as like-minded or from your niche. Having that connect with help you plan collaborations, giveaways or link parties in future. If you have knowledge about a specific domain, don’t shy away from shooting a mail to related blogs, asking if they would be interested in having a Guest-post on their blog. Hosting and doing guest posts in related domains help in creating a personal brand. Readers from your niche would recognize you and follow you to your blog for more. Do allow Guest-Posts on your blog, as link-up’s are good for your blog health. However, ensure that they are in your domain or segment and not some random post. Irrelevant posts will do you more harm than good. SEO might sound like a jargon, but it is necessary for your blog health. If you are a non-techie take help of plugin’s like Yoast SEO and Hemingway App to improve your post SEO. These plugin’s help improves your post content so that your blog does not miss out on search engine traffic. These are a few tips that will help you get quality readers to your blog. This September I am writing posts that are helpful for bloggers or small businesses to push themselves on social media. If you wish to start off on Facebook marketing, do read my post-Facebook for small businesses and personal brands. A very helpful post, Neha. I like that you’ve used terms and language that new bloggers, and tch challenged ones like me, would understand. Very helpul and detailed post Neha. Traffic is one of the most important things to grow your blog and its reputation. Nicely put Neha – some very valid inputs there. I whole heartedly agree about reading, sharing daily as that really increases your interaction with other bloggers. Great points Neha. I agree with all of them especially about being consistent and sharing. This was such a helpful post, Neha! I follow almost all the tips you have given here to the T. Just having some extra dose of patience is also very necessary, because, well Rome wasn’t built in a day – that’s what I keep reminding myself every day! Thanks Neha. this series of yours is proving quite valuable for me. I had no clue there were plugins to boost SEO – just found that out at Atul’s blog and now here you are reiterating the same thing. I really need to look into it. I think I’m okay on the other parameters except I have my limitations about how frequently I can post, read and comment. Thanks Tulika, Happy to know that you found it useful. As I said read, comment daily and maintain a schedule for posting. A very valuable post indeed Neha. Great tips all of them. Thank you so much. this is a great post for someone like me who is looking to increase blog traffic. I love all the points and I will try my best to follow them religiously. And this commentluv is a great idea. Who wouldn’t want to leave a comment and check that box? Awesome. Was worth visiting you here. Have a great day! Nice and helpful tips. TFS. Such great tips, Neha.. Look forward to reading more such posts on your blog. Perfectly put golden rule. For me being consistent does top it all as you rank better on search engines, apart form using appropriate key words on each post. Very True. Thank you Ramya for stopping by. Thank you Neha for sharing these tips. I am going to keep in mind the reading and participation in community campaigns very surely. Thank you for writing this very helpful post! But totally agree with these points. These are some great tips, Neha. I was unaware, until I started the Alexa Campaign this month, how important networking is to blogging. Great tips very succinctly put. I diligently follow all 7 tips and have been doing so for a year now but still not seeing amazing results. Perhaps I still need to find the right niche and right voice so that I generate the right content. Thanks for these tips though. A very helpful post. As a newbie, i sometimes flounder – you have given a road map guide. Useful. I write poetry so it’s difficult for me to write long posts. Any ideas? Thanks! Awesome! A to do list. Thank you for sharing some useful tips to increase the views. Very useful post for the bloggers, Neha. Would like to explore your other posts on blogging. hey.. thanks for the tips.. i loved the guest blogging idea and being consistent. Can you suggest me plugins like yoast, for blogspot/blogger? Thanks for this wonderful post. I have been blogging since 2011 but had never taken it seriously. Now that I have time on my hands, I plan to put it to good use!